The Mrs. and I thought that the recent wind hammering would result in firm and fast travel conditions so we planned a 'tour'. Crystal to Chinook pass, down Cayoose to Owyhigh lakes trail, up to the lakes and camp then out Owyhigh to the White River road and finally down 410 to the Silver Springs snow park. Nevermind it was gonna be epically cold. We almost bailed after having the worst run of either of our lives into Crystal Lakes. But Morse Creek skied great so we kept going. It was extra slow going past Sheep Lake and I always flub the last bit onto 410 from there. When we hit the top of Chinook we were 3x slower than our plan. The slowness was mostly due to the terrible trail breaking on windslab that was soft enough to punch through but firm enough to trap your tips underneath. But there was soft powder in sheltered, west facing spots. 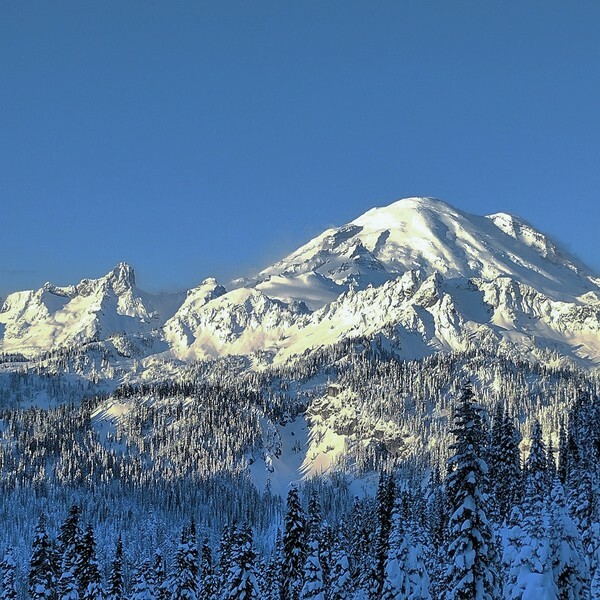 So we decided to change the plan, drop the camping gear and ski laps on Naches and Yakima pks. After setting up camp we started to brew up. After 1.5 hours of cooking inside the tent our first canister yielded a whopping 1.5 liters of cold water. The second canister (brand new MSR) had a bad valve and we were never able to get it to emit its contents. That meant no dinner, no (hot) breakfast and NO COFFEE. It got dark at 5:15, the low that night was -6F. So no skiing on day two, just brutal down slogging + dehydration through breakable windboard on 410. At least the view of the Cowlitz Chimneys and Governor's Ridge was all time in the AM. Bummer about the cold meals. And no coffee! Remind me to buy you a cup when we meet. Wow a cool plan but foiled by equipment failure. Out of curiosity - how did you get to Crystal Lakes now that uphilling in Silver Basin is not allowed? Cool trip! I realize they are out of vogue now, but it seems like an old-school white gas stove might have some advantages for this kind of trip. Would you consider a different stove if you had to do it over, or would you just pack more canisters? how did you get to Crystal Lakes now that uphilling in Silver Basin is not allowed? We used our season passes. But uphilling into Silver is allowed, it's just subject to more rules. Would you consider a different stove if you had to do it over, or would you just pack more canisters? I think a whisperlite with a 0.5 liter bottle would have been plenty and would probably have worked flawlessly. I have used jetboils and reactors for years in extremely cold environments (Denali, Himalaya)� but this experience has definitely soured me on them. That snow looks worth the struggle! Canister stoves are a pain in cold weather, they are a gift when they work, so light and convenient, but seems that it's hard to beat white gas when it's so cold. How skiable was the snow at low elevations, esp on White R Rd and WA-410? 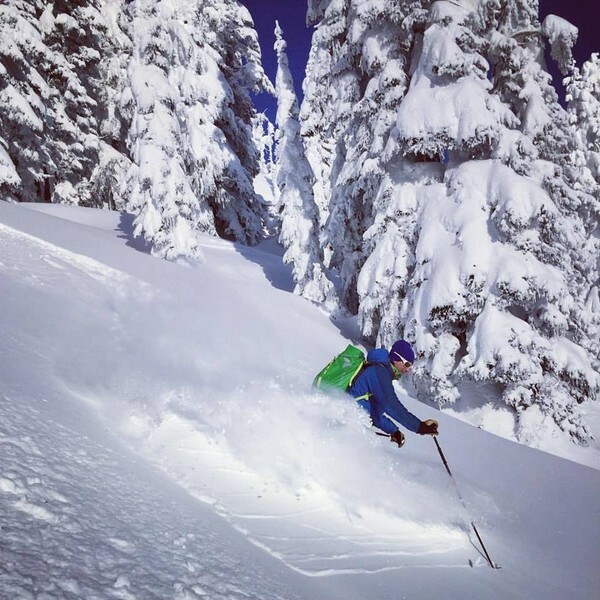 Thanks for the early morning chuckle - nice photos of what skiing you managed. Love the thrasher photo. Good story to laugh about back in the warm house. Cheers. 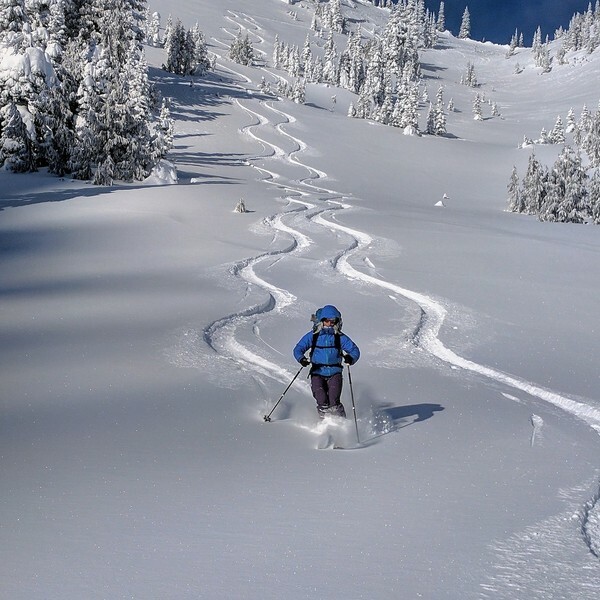 Based on my understanding of the uphill rules, you cannot ascend on skins through Silver Basin to the saddle between Threeway Peak and Silver King during the ski area operating season. So the only way to skin to Crystal Lakes at this time from Silver Basin would be to cross the divide into Morse Creek somewhere east of Threeway Peak, then cross the SW ridge of Threeway to Crystal Lake basin. I understood it as when they are open. So you could get in there before lifts are running assuming they aren't doing avy control. Is that an incorrect understanding? Okay, I think you are correct. 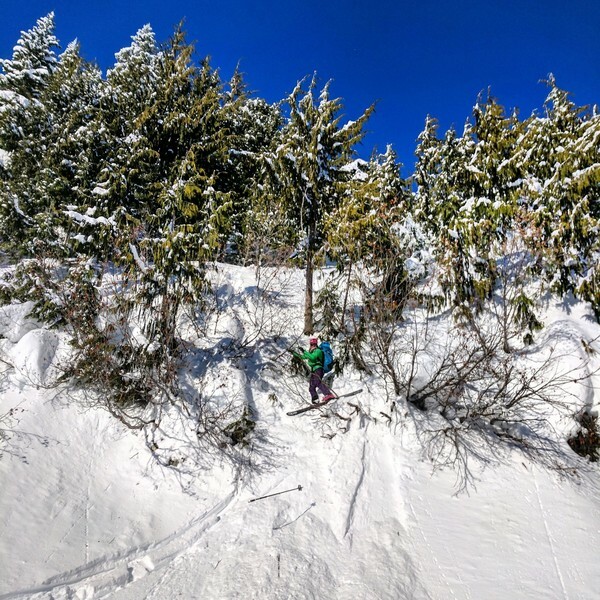 "When the ski area is open for the season, all uphill travel into Southback is prohibited." "When the ski area is open, all uphill travel into Southback is prohibited." 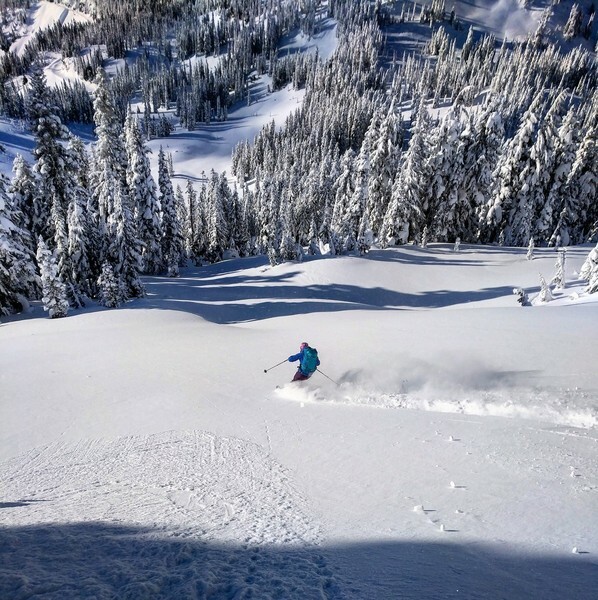 Note to Crystal Mountain: You need to update your official uphill-travel webpage with the information announced on your blog! FWIW, I've read that using an MSR Reactor with a canister immersed in a shallow water bath works well in winter conditions. Also that it's the stove to have if you need to melt snow for water, and you want to use a canister stove. IME, the Reactor boils water incredibly fast, but I don't winter camp. That bad valve on the MSR canister was just bad luck. If it were me, I'd make sure to let MSR know. It seems the general consensus is that MSR stoves with detached fuel bottles are best for winter camping. Although those stoves can also malfunction, they are at least field maintainable, and will be least likely to malfunction if regularly maintained. I don't think this is an effective way to communicate with their management. Also, I'm pretty sure that they mean it is now closed 24/7 when the ski area is in operation. These policies need to be in agreement and they need to be unambiguous about when uphill access to Silver Basin is allowed. Since Kim Kircher has posted on TAY regarding the policy, I hope that somebody in the know can tell us what the unambiguous policy is on Silver Basin access. Swaterfall, you really should have known that your noteworthy polar-conditions trek out to Chinook would result in a Silver Basin uphill traffic polemic. When you and the Mrs. get stymied by conditions, one can be sure it was serious stuff. Thanks for the story and pictures! FWIW, I've read that using an MSR Reactor with a canister immersed in a shallow water bath works well in winter conditions.� Also that it's the stove to have if you need to melt snow for water, and you want to use a canister stove.� IME, the Reactor boils water incredibly fast, but I don't winter camp.� That bad valve on the MSR canister was just bad luck.� If it were me, I'd make sure to let MSR know. The warm water bath works great for gas canister stoves in the winter. I use a small square of ensolite pad to set on the snow and a shallow metal pan that can hold about 1/4 inch of water without spillage. You have to refresh the warm water every 5-10 minutes but it keeps your canister stove roaring in very cold temps. Now that you're home, does the canister valve/stove work correctly? Trangia Westwind alcohol stove !!! Lifetime never fail . Hey Seth, I finally made it over here! Impressive tour. You guys dig any pits out on Naches? Hoping the snowpack is settling some for you guys, and watching for storms. The woman they found just outside the Crystal boundary would seem to indicate things aren't settling down too well yet. Looks like you guys are back in a stormy pattern next week. Just booked a flight to Denver for MLK weekend....but I could change that to Seattle if you think a favorable setup is in the cards! The warm water bath works great for gas canister stoves in the winter.� I use a small square of ensolite pad to set on the snow and a shallow metal pan that can hold about 1/4 inch of water without spillage.� You have to refresh the warm water every 5-10 minutes but it keeps your canister stove roaring in very cold temps. SotH, have you used this system? I love the simplicity of the design and weight. It's awesome that it needs no messing with during heating and cooking. However, even though the author addresses the concern of the canister overheating, I can't help feel a little nervous about it blowing up. Thoughts? Experience? Sounds like a rare mechanical failure. One thing I like about them is so few parts that can fail. The reason canister stoves work in the cold at altitude, but not cold closer to sea level. You can place or tape a handwarmer to the bottom of the canister if you don't want to splash about with a warming pan. I'll bet it was cold, big difference between psyched and not psyched. Crystal. Buy the way, nice full page pic in Backpacker magaazine. See ya in the Gondy Line. Some Chilean mountaineering friends first told me about the idea of a heat exchanger using copper. They coiled the wire around the canister and had the other end near the flame. Even they, who were not the safest climbers to learn from, thought it was kind of sketchy. But necessary in the very cold, high altitudes of the Andes. Upright canister stoves really struggle at those temperatures. The water bath would certainly make a real difference. Even better and easier would be to use an inverted canister stove such as MSR WindPro II. This stove will work easily at those temps with the canister inverted.